Stone tools first appear in the Archaeological record over 2 million years ago, and many believe that their production was perhaps the most important factor distinguishing our early ancestors from other animals. 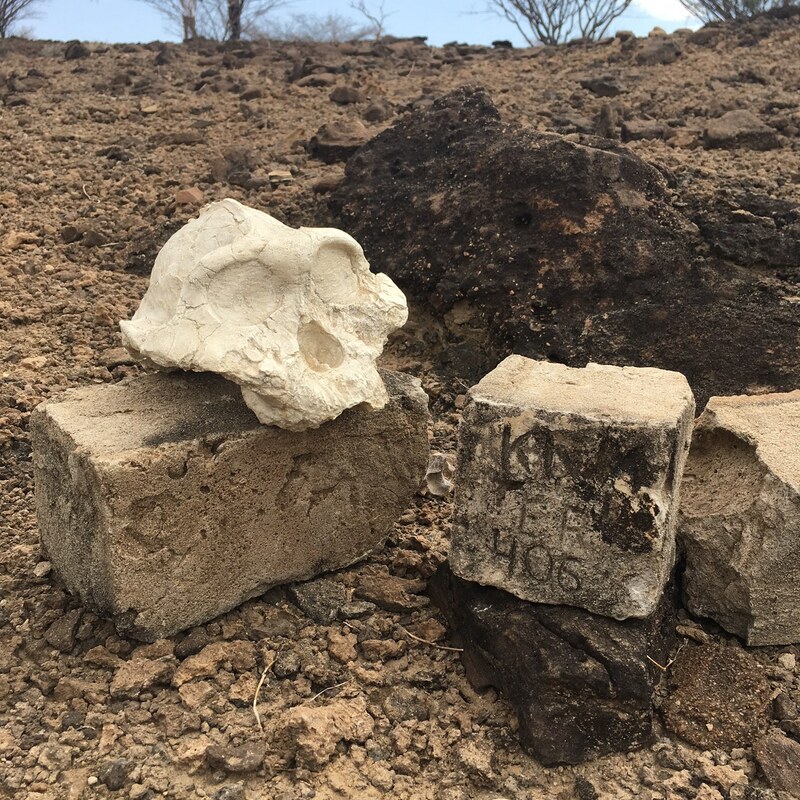 The Rift Valley, and Turkana Basin itself, are both home to the earliest sites of stone tool production: early stone tool creation is known by researchers as the "Oldowan" industry, named after Olduvai Gorge in Tanzania. 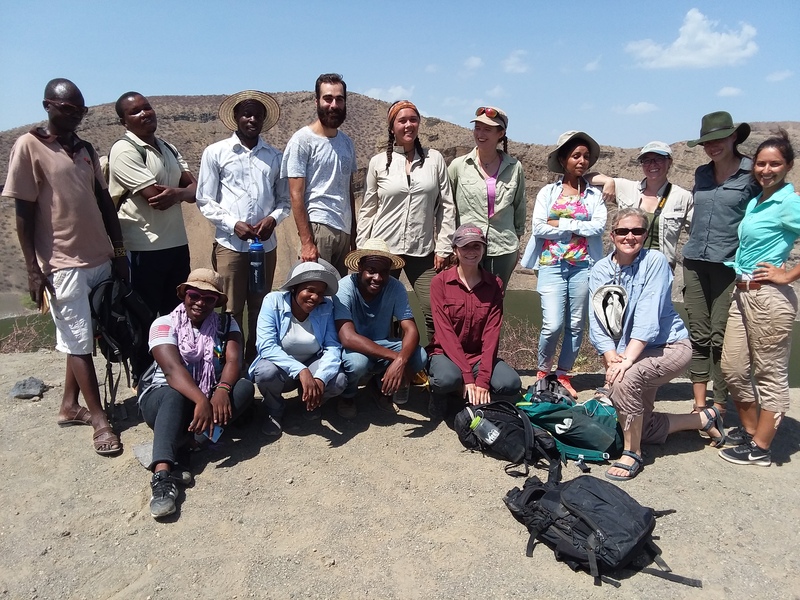 Professors Veronica Waweru and Helene Roche helped TBI students understand the Oldowan and its importance by having them recreate this technology themselves. The instructors then pushed students a little farther: could they put their tools to use in the field? Students begin skinning a goat using the tools they made in their Archaeology class. 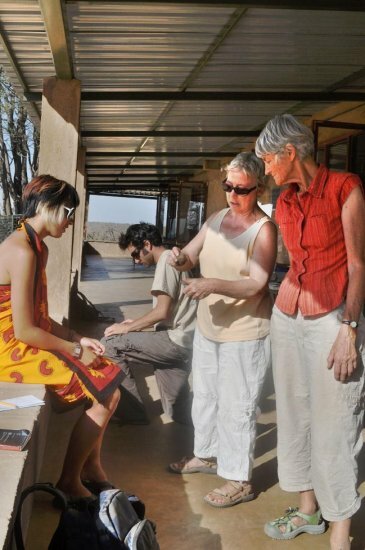 Helene Roche is a French archaeologist and a specialist of early stone age technology in East Africa. 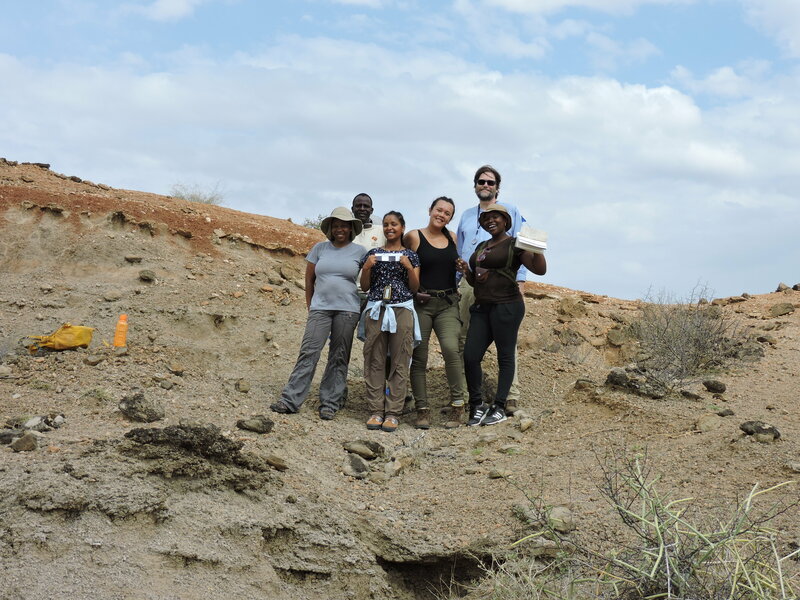 She and her research team have excavated Lokalalei in the Turkana Basin, finding stone tools 2.3 million years old, some of the oldest identified in the world. 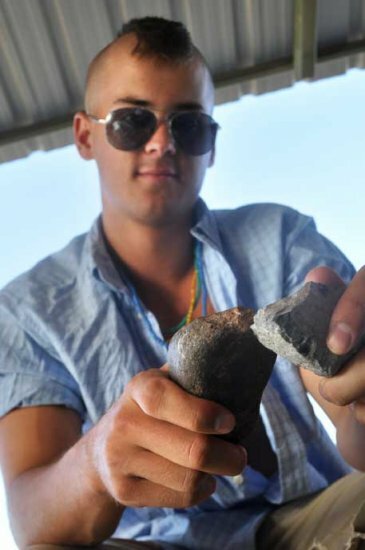 What professor Roche has demonstrated is that the people who made these Oldowan tools were far more sophisticated, in their understanding of tool manufactory and stone fracture mechanics, than had previously been appreciated. 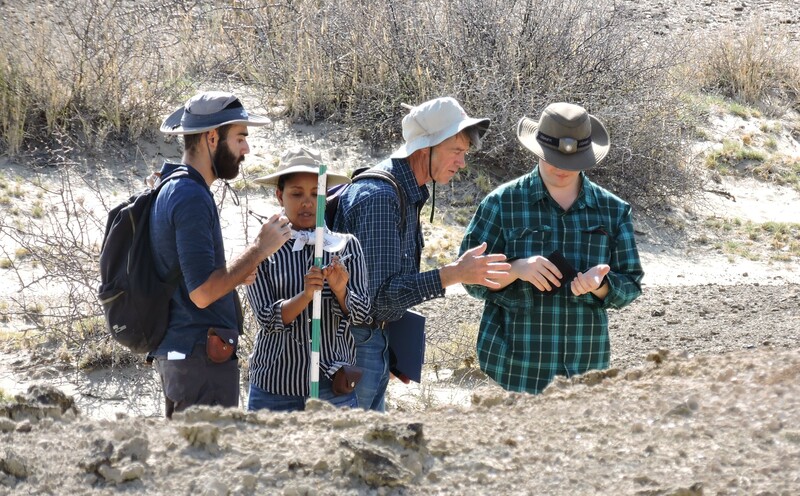 Helene Roche and TBI Field School directory Veronica Waweru are both co-teaching the ongoing archaeology course, and their lectures have been punctuated by a series of hands-on activities bringing ancient history to life. 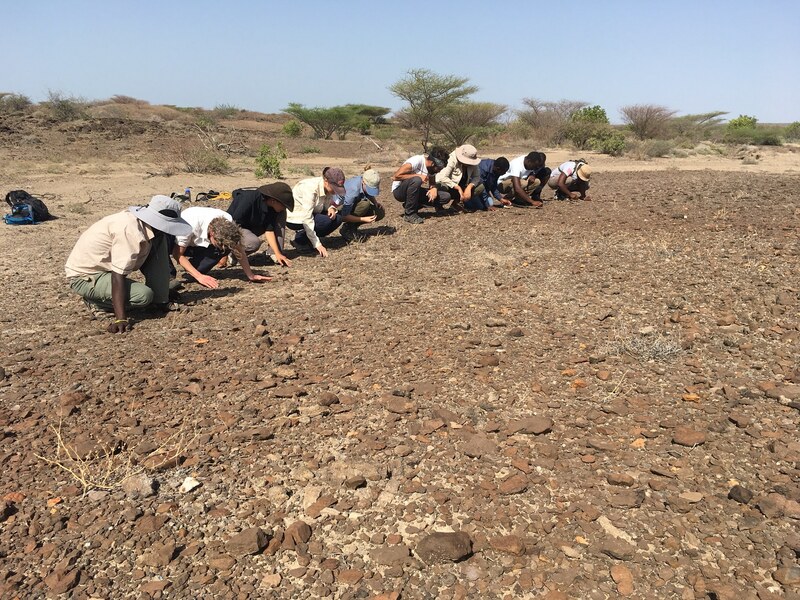 To help students understand just how difficult stone tool production can me, Helene and Veronica led them into the field in search of raw materials to make their own tools. After a few days of tool production, students used their implements to butcher two goats, eaten by the Field School students and staff for dinner. Helene Roche shows Priscilla and Meave how to properly hold a hammerstone when striking a core. Stone tools are important because they create extremely hard and sharp edges otherwise rare in nature, and useful for quickly cutting plant or animal tissue. In order to create stone tools our ancestors chose raw materials from which they would break flakes, or sharp fragments. The material from which flakes are struck is called a core, and the rock used to break them off is called a hammerstone. Students collected basalt, a kind of volcanic rock, for their cores, and quartz boulders as hammerstones because of their hardness. Despite the best efforts of Helene and Veronica, students proved less capable than their ancient ancestors when trying to produce stone flakes. Wyatt stabilizes a core on his knee while he strikes it with his hammerstone. Students often had to sit, stand, or kneel before finding a position comfortable for stone tool production, also known as knapping. Alisha sits on the ground while knapping. Within an hour, students had already amassed a great number of stone shards and fragments. Though most did not resemble classical flakes, they were nevertheless sharp. Peter uses a hammerstone to produce stone flakes. Sometimes students tried to strike basalt cores with basalt hammerstones, sending flakes flying from both raw materials. A goat that has been slaughtered for subsequent butchery. Goats are ubiquitous throughout the landscape of Turkana, and are regularly slaughtered by the local people and at TBI for food. Above, the goat has been killed with a modern knife, rather than with a stone tool, to quicken its passing. 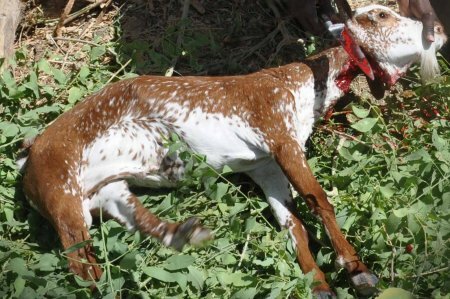 The animal has been laid above a bed of Esekon leaves, known among other things for their antibacterial properties. 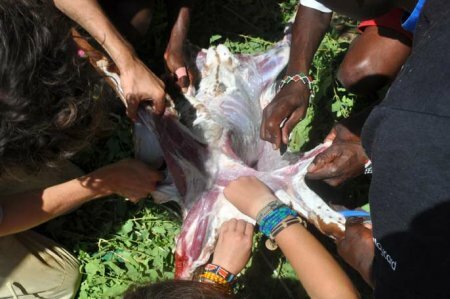 A throng of hands sets to work skinning the goat. Stone flakes of almost any shape proved especially sharp, quickly cutting through hide and flesh. Francis, Johnmark and David laugh after seeing that the goat’s intestines have, in typical Turkana fashion, predicted continued drought. 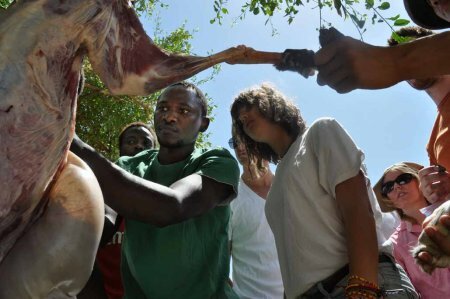 The Turkana say that the contents and shape of the intestines of a goat can predict the weather, and both Francis Emmekui and JohnMark Ekeno were eager to demonstrate this principle. Nobody was surprised when the goat’s insides augured continued drought. Johnpius removes the digestive organs of a goat as Luke, Peter, Meadow and Kasia look on. Johnpius Mpangarusya is a TBI student and native of Tanzania. Because he grew up on pastureland south of Lake Victoria he was familiar with butchery and comfortably accomplished tasks that made others squeamish. 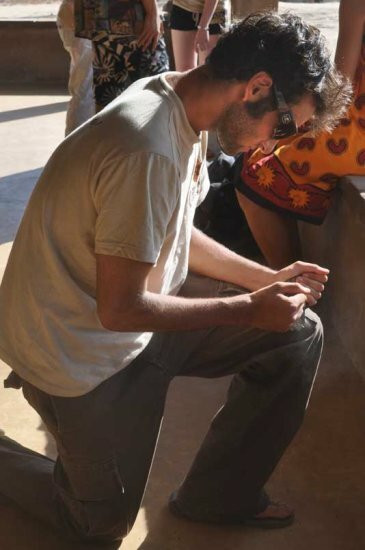 Ben holds a quartz flake in his hand after the butchery is complete. Larger tools proved essential for disarticulating the limbs and joints of the animals during butchery. 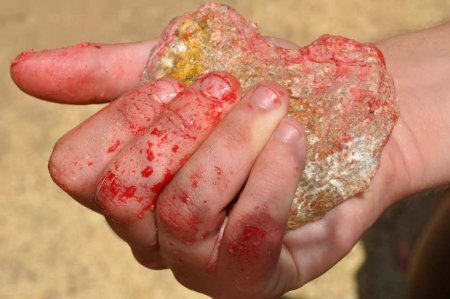 The excercise was gory, but helped students understand the utility of stone tool production by their ancestors. Photographs by Meadow Colden, Quan Duong, Veronica Waweru and Daniel Green.